Tilly's Travelling Telegram: How Can I keep My House Safe When I Am Away? It's easy to set up because you pair the hub with the devices included in your pack. This is done with one click of a button. If you decide to add more to the home safety system, it is easily done by using the same method. The devices will work up to 300 metres away from the hub, So you can place the camera in the garden and have it focused on your house. Then have the two door alarms placed on the front and back door. The smart plug is used to switch your appliances on and off at a certain time, so it looks like someone is at the property. It's also ideal for children that need a light on through the night in their room. You can set it to switch on in the evening and switch off when its morning. The Home safety system is controlled manually whilst you're at home or on the smart device that you have. All you need to do is download the free app and set it all up, there is no additional fee's once you have bought the security system. So the initial outlay of £229 is all that you pay. 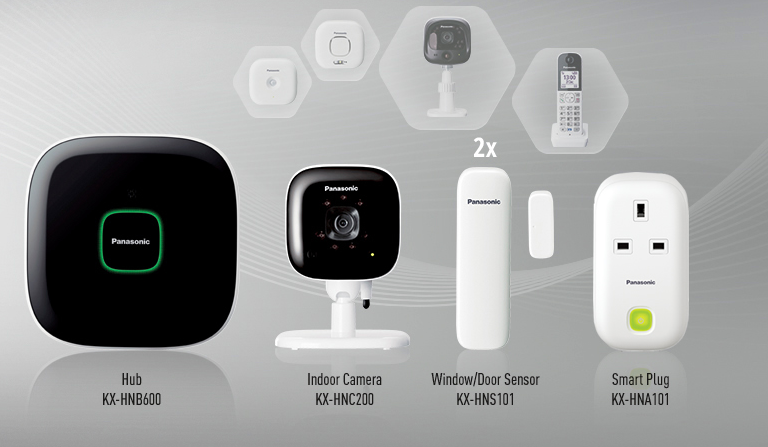 The system can grow with your family and you can add cameras in the rooms that your children sleep in, this gives you peace of mind if you go out of the house and into the garden. The camera in the system also has 2-way communication and you can talk to people in the view of your camera - even if you're halfway across the world. If you are away and leave the rest of your family at home, you can also look in and check on them. The camera also has an SD slot to hold a card for filming the activity around your home whilst you are away. To be able to use this, you will need a WIFI connection, iPhone 4 or above, iPad with ios 6 or above or an Android tablet/phone 4.0 or above.